Viewing topic "Help on midi import not using the right voice"
Hello, I’m new to the MOX/midi file world and came across the following problem. Can’t find a similar issue in the archive so here is the description. I though the file was damaged but when I look at it using Anvil Studio the track is actually a drum track and plays fine on the PC. Sounds like the original author of the file used Program Changes but failed to use Bank Select commands. You can either correct this oversight or remove the original authors selection of Voices and choose your own. If your data reads “***-***-000” where there are asterisks instead of the “127-000” then the author failed to insert the BANK SELECT commands (very common in files prepared for GM devices… the author failed to realize that you might actually play back the file on a device that had more than just GM sounds. So they get lazy with inserting the Bank Select commands… as GM only devices can only have drums on PART 10, the MOX can have any sound you want on Channel 10, not just drums. hmm, it’s the way you say ( the second case where ***. ***.008 is shown ) but I don’t think it is the reason of the malfunction. I loaded this midi in the MOX months ago and it was fine. So why now the drum voice is mismatched ? To confirm that I reset the MOX to factory defaul. Loading the same sone into different song names ( overwriting the 3 demo songs ) produces different results. It looks as if the sequencer keeps memory of what was there before. Another simple test:I recorded (on the MOX) a few bars of a three tracks song.It plays fine. Drum and piano. I saved it as midi on USB stick and then loaded it under a different song number. Again the voice is changed. At the end of the article there is a downloadable GM File that shows the proper layout of the data to make a GM File that will work on any compatible product. It is a great way to learn what should be placed where and what messages are used. Thanks. I’ll look at it. just to close the thread, the midi file downloaded from the site you suggested works fine. Still not clear to me why a song created on the mox6 and then saved on USB as midi file is not re-imported correctly ( drum truck plays a bass sound )..... but maybe I’m doing something wrong. Thanks for your support anyway. 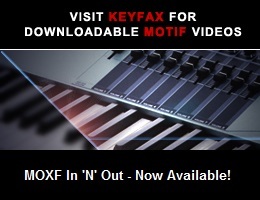 MIDI File (SMF) do not have any MOX specific parameters (like you Mix settings) - the MOX Mix setting would be meaningless to any other keyboard. The data that gets placed in a Standard MIDI File is the data that ANY MIDI keyboard will understand. So when you create a sequence on the MOX it make sense to save it in a MOX proprietary file format - proprietary means it will save the MOX-specific parameters. If you are authoring GM Files for others, then you would need to insert Bank Select and Program Change messages, use the GM RESET, etc., etc., etc. GM protocol is very robust and very mature, so yes, it is probably something you are not doing properly. If you are baffled as to why your file does not work - post an example. But unless you are authoring generic GM file - it is recommended that you save your Sequence data in either an ALL data file (.X4A) or ALL SONG (.X4S) or ALL PATTERN (.X4P) file formats - these automatically include not only the MIDI data in the tracks but the MOX MIXING setup as well.